A former public school teacher and corporate trainer, Priscilla has specialized in staff development and training in the education, publishing and software industries since 1991. As a senior trainer for The Bob Pike Group for 16 years, Priscilla has presented seminars nationally and internationally. 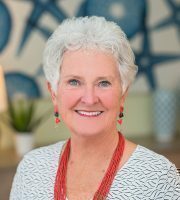 Priscilla began her Real Estate career in 1986 in Burlington, VT and was a manager for a boutique firm there as well as one of the Northwest Vermont Board of Realtor’s trainers for new hire orientations. She is partnering with her husband, Jack Hurley, to bring their creative vision to Lowcountry clients.